Night begins and a radiant Milky Way appears in the clear skies of the Atacama desert. The European Southern Observatory's Very Large Telescope (VLT), situated in the Cerro Amazones (left) of Paranal (Chile) starts its night observations. 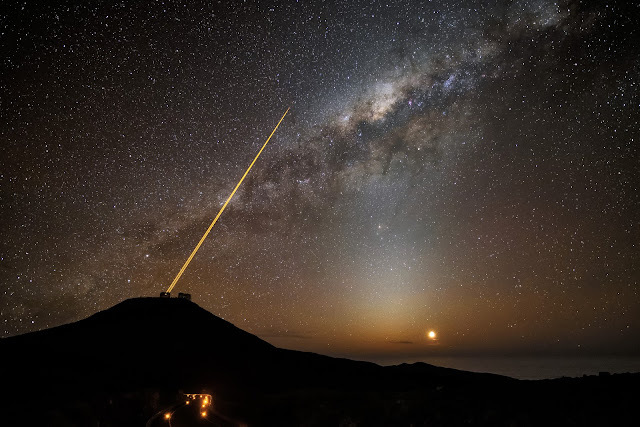 The two laser beams from the VLT are pointed towards the sky and create "fake stars". These fake stars are part of the technique known as Adaptive optics, and are detected by sensors, which use them to measure atmospheric distortions. Once the distortions are known, this information can be used to correct astronomical images, greatly improving their quality.